Always show you give a hoot every time you wear your Breast Cancer Awareness Sweatshirt. This is the perfect item to wear for awareness events during cooler months! You'll also look great running around town in this sweatshirt doing your day to day errands. 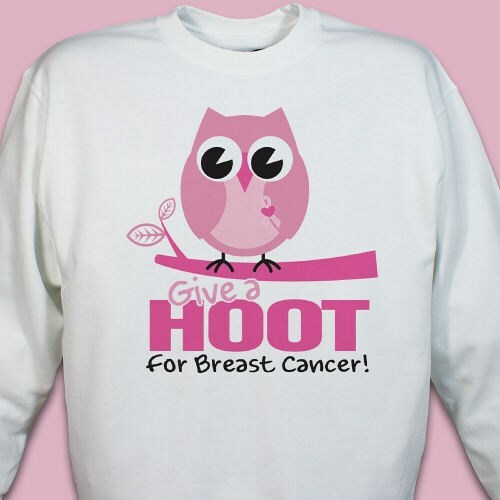 Our Give a Hoot Breast Cancer Awareness Sweatshirt is a great way to support the fight against Breast Cancer. This Custom Printed Breast Cancer Awareness sweatshirt is available on our 50/50 cotton/poly blend white, pink, & ash grey sweatshirt, machine washable in adult sizes S-3XL. Shop all Breast Cancer Awareness Apparel & Walk Gear from MyWalkGear.com! You will also like this great and eye-catching design featured on our Give a Hoot Awareness T-Shirt & our Give a Hoot Key Chain as well.